"Donald Edward Gingras, Westbrook College, Class of 1978"
Westbrook College student Donald Edward Gingras, Class of 1978, was a Nursing major and a Day Hop. For his senior class candid photo, which appeared in the 1978 Tower Yearbook, he wore jeans, a striped shirt open at the neck, and a barn jacket and scarf. Donald's dark hair was long and parted on the side, and he wore a mustache and aviator shaped eye glasses. 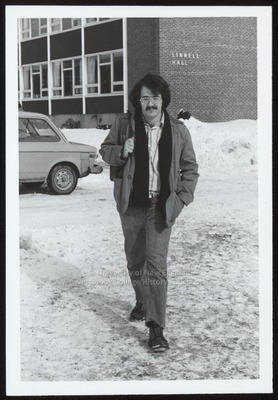 With one hand in his jacket pocket and the other holding a book bag over his right shoulder, Donald walks across a snowy campus from Linnell Hall toward the Campus Green.